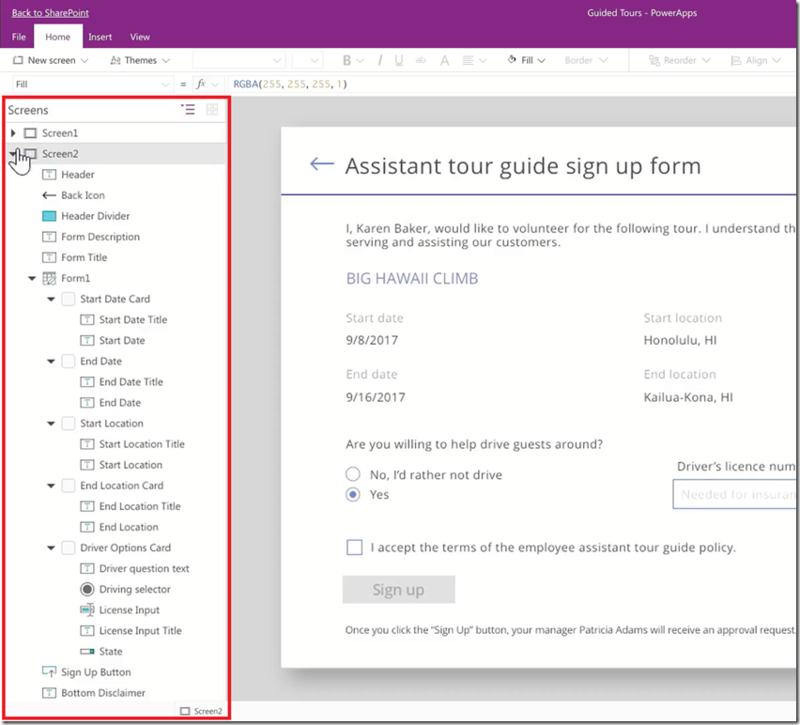 Today’s announcements at the SharePoint Virtual Summit bring out the best features of PowerApps with SharePoint. We are embarking on a journey to unleash cool capabilities for authoring apps and running apps embedded in SharePoint to enable a seamless experience. We are excited to announce the following capabilities in PowerApps, which we'll be rolling out in the coming months. You can see a preview of these capabilities in the video at the end of this post. You can create visually rich, well formatted forms using PowerApps for SharePoint lists. From the SharePoint list, you will see a “Customize with PowerApps” option to launch the PowerApps authoring experience in the browser. Once published, the rich forms will be embedded within the SharePoint list and available to all users of the list. PowerApps Studio will include a Screen Explorer to view the list of controls in the app. Every control can now be selected by choosing them on the screen explorer. The screen explorer removes the hassle of selecting hidden or overlapping controls. Of course, you could always switch back to the tile view that exists today. The Options panel on the right of the design canvas will light up the frequently used properties for every control. Simply select the control in the screen explorer and start configuring the properties using the options panel without the need to write expressions. 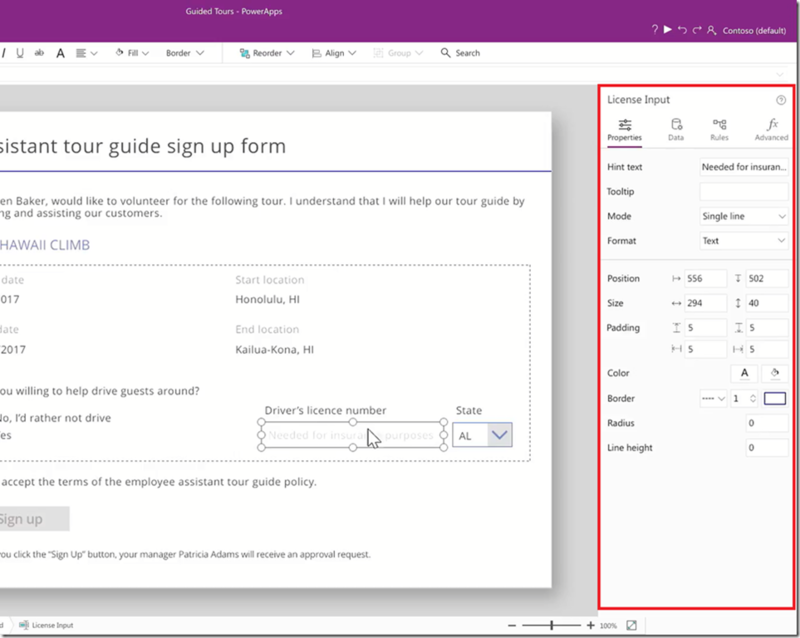 PowerApps can be embedded as SharePoint Online web parts. 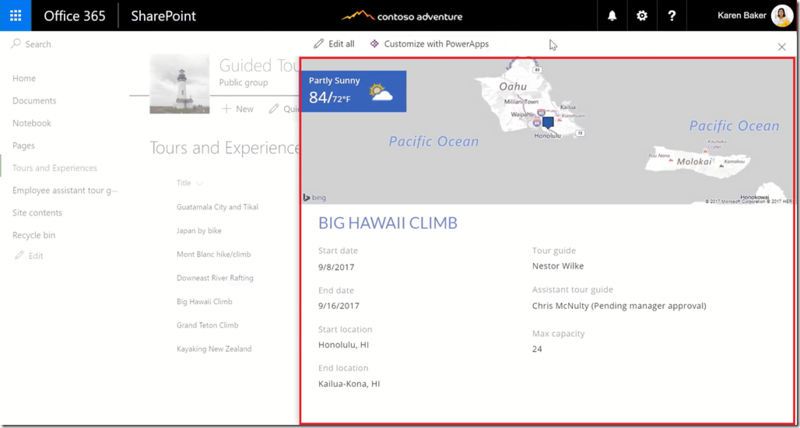 You will be able to browse and embed PowerApps in SharePoint. You can get started today by using the Content Embed web part outlined in this post. We will be rolling out more enhancements to this experience going forward. PowerApps is excited to have built this experience enabling SharePoint users create business apps with zero code. We will also be adding support for images, attachments, and managed meta-data with SharePoint Online. We expect to roll out functionality incrementally in the coming months and would love to hear your feedback.